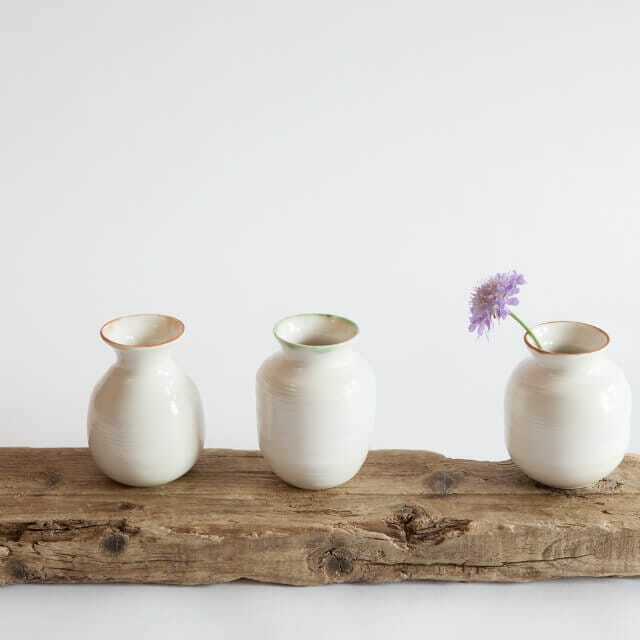 Posy vases to brighten up small spaces and show off a winter sprig or spring blossom. Kirsty’s bronze lustre rim studio porcelain pieces are reminiscent of simple classic Japanese forms. Specific brushes are used to highlight detail and line. The pieces are fired three times to achieve a gloss glaze and contasting oxide and bronze lustre rim detail. Her copper green rim pieces are inspired by Japanese Oribe ware. Each piece strives for individuality, through both making and firing. These products are available with a copper green rim or a bronze lustre rim. I originally trained at Brighton Art College. However, my main inspiration and methods of working were developed whilst training on the potters's wheel in Japan. I became particularly inspired by the Oribe style of glazing and this influenced her subsequent work. With a delicate style of throwing and combined poured and dipped glazing technique, I have created a unique collection of studio porcelain. Each piece contains an element of spontaneity and individuality, with refined throwing lines combined with the incidental marks and story of the glazing technique. My bronze lustre rim studio porcelain pieces are each fired three times to achieve a creamy gloss glaze and oxide and lustre rim detail. 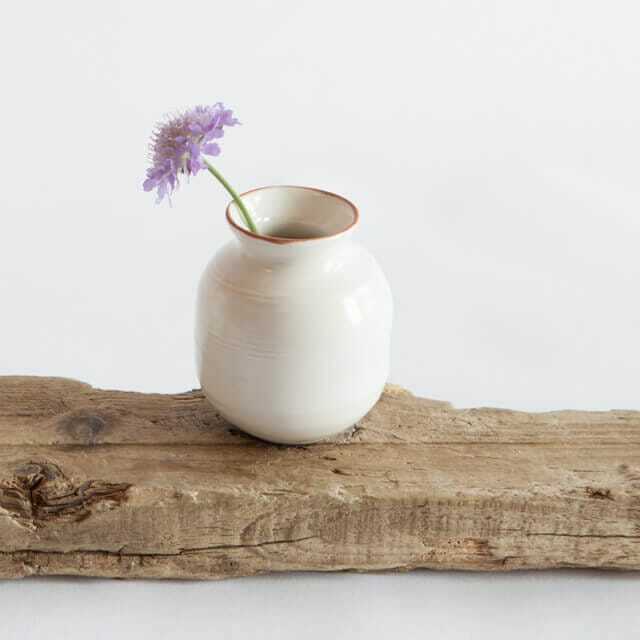 My tableware pieces have their origin in the simplicity of classic Japanese ceramic forms. They are glazed with a dolomite and tin satin glaze and a dipped cobalt blue rim. I have also developed a range of tableware pieces with a gloss finish and delicate copper green rim. 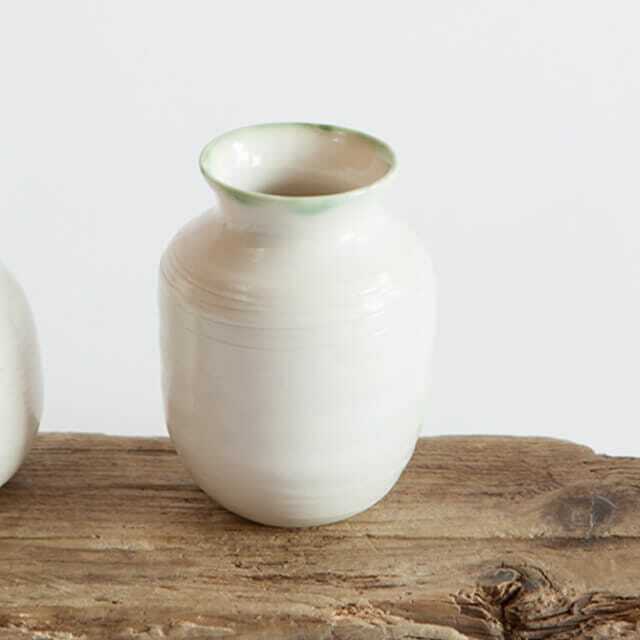 Kirsty Adams Ceramics is included in the collector’s handbook of British Studio Potters’ Marks and Handmade in Britain - Appreciating Contemporary Artisans. My work has been exhibited in many UK galleries and sells internationally. I currently stock work at Storie Shop, Paris and Penates Interiors, Saint Remy de Provence. My work has been featured on the set of the BBC series The Great British Bake Off and I have exhibited as part of the high profile Heal’s Modern Craft Market. I have also recently featured in China Ceramics Illustrated magazine, Country Homes and Interiors and World of Interiors Magazine.